This post is part of an ongoing Good Client Guide series, which serves to demystify the web development process and empower consumers of web design (known to many in the industry as The Client™) to be an informed and effective partner in the process. Missed a step? Check out Step 3: Phases Of A WordPress Project. You’re excited to begin working on your website! You’ve done your homework, found what type of professional would be a good fit, and you know generally what to expect once you get started. There’s just one tiny little elephant in the room that needs to be addressed, and that’s how much all of this is going to cost. You already have an idea that working with a larger team of people, or a more experienced/specialized individual, will probably cost more than a smaller group or someone less experienced – that’s pretty common, and I’m sure you’ve dealt with that on other, non-web projects before too. After all, it costs less to pay a friend to come over and help you with home repairs than it does to hire a handyman, which is less expensive than hiring a certified professional or teams of contractors to do work on your house. But there still seems to be an element of “the magic black box” when it comes to website pricing, and it’s time to demystify that! I have heard dozens of versions of this question, and I understand why it’s being asked. If you’re going to invest in a major project like a website redesign or new website, you want to know how much money and time you’ll be investing up front, so why not ask? Unfortunately, there is no direct answer to this question. Websites are a lot like houses in this respect. You can’t ask the question “how much does a house cost?” because there are so many different factors that influence housing prices. The size of the house and the neighborhood it’s located in are major influences – a 4,000 sqft house and an 800 sqft condo in the same neighborhood would sell at vastly different prices, but an 800 sqft condo in certain areas (like popular neighborhoods near urban centers) might cost as much as a 4,000 sqft house in less populated or desirable areas. Pricing also needs to factor in the materials used in the construction, the appliances included, the paint, trim, and other finishes. How much demand there is in the market, whether it’s a new build or refurbished, whether it’s been updated. Whether it’s being sold as-is, or the sale is conditional upon certain criteria being met. Aside from cost, many other factors contribute to deciding which house best fits your needs too, like the location, the schools, proximity to transit or commerce, property taxes, or commute times. Because there are such huge variances in selling prices, you can find some kind of house that fits nearly any budget. However, you will not be able to find every type of house within every budget. A large, spacious, updated house in a desirable neighborhood with tons of amenities will probably not come cheap, but for a low price you could probably get a large, spacious house in a more isolated area that needs more work done, or a very small condo with updated amenities in that desirable neighborhood. Similarly, every “type” of website (like an eCommerce site, a business site, a membership site, etc.) can exist at every price point (even the very low prices!) But, not every “scope” of site can exist at every price point. “Scope” is a word that encompasses the entirety of your project, including its own features, the timeframe, and the environment within which the project is being executed. Within your scope are several factors that influence price. As soon as your scope become more complex, that price is going to go up. 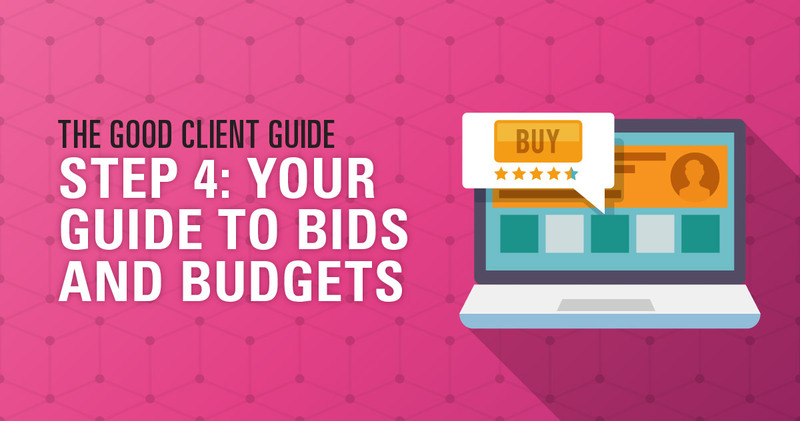 In addition to the number of people you hire, and their respective experience levels, your website project itself has several elements that will influence the prices you see in bids. Value of Final Product – This could be a dollar value of the site itself, or the value of the company behind it. It also involves project visibility, how much is at stake, and how much risk is involved. This is often related to the Mission Critical factor, but also has to do with the worth of the site to your business or organization over its lifetime. Difficulty/Easy of working with YOU – Additional project management time is often budgeted in for clients that need more hand-holding, are more indecisive, or are more resistant to following project conventions. Of course, because you’re reading the Good Client Guide, this isn’t going to be you! It also accounts for other time-consuming factors, like the amount of red-tape or bureaucracy that needs to be navigated, the number of necessary meetings, and how many people have to give approval or opinions. People often balk at the idea of sharing their budget up front, usually for one of two reasons. Either they think that their designer or developer will inflate the cost of their bid in order to get all of the money (and, conversely, would be more honest with them if they were quoting in the dark instead), or they haven’t figured out what their budget is yet (and think they will “know it when they see it”). If you belong to the former group, hear me out, because this isn’t as unusual as you might expect. For example, when buying a home, you often tell your Realtor an ideal price range in addition to the amenities and neighborhood you desire. Maybe you have a home buying budget of about $150,000 (after expenses), but would consider going as high as $175,000 if certain criteria were met (maybe an updated interior or close proximity to a cultural center). Your Realtor would be able to either find you homes that matched your criteria within your budget, or help you adjust your criteria to fit your budget (maybe the neighborhood you really want doesn’t have anything available within that price range, but nearby neighborhoods do). It’s the same process with building a website. If your budget is in line with your scope (or even larger than what you need) then your designer or developer can confidently put together a quote that aligns with your expectations. If your budget is lower than your scope, you can work with your contractor, team, or agency to figure out how to align your scope with what you have to spend. Perhaps this is removing certain features, increasing your timeline, open sourcing some components, or breaking it up into multiple projects. If your budget winds up drastically different than your designer or developer’s normal client base, you can choose to work with someone else early on rather than spending a lot of time on interviews, quotes, and bids that don’t ultimately match the reality of the project. Knowing the general budget in advance makes everyone happier and saves time. If you belong to the latter group, or are just unsure of your budget specifics, that is ok too. It can even be helpful to know what order of magnitude your budget is – $500? $5000? $50,000? $500,000? That’s a very useful first step that can eliminate several considerations right away. If you think that there “isn’t a budget,” then try the following thought exercise. Start asking yourself, “If I had the website of my dreams that produced the wins I need to be successful, how much would I feel comfortable paying?” Start from a low end and work your way up the number range. You might start getting a little uncomfortable with the numbers, but don’t stop until you get to “I definitely can’t afford that no matter how successful this website is!! !” Congratulations, you just found your website budget ceiling. Your true budget will probably be just under this mark. Even if you’re doing everything right and get a thoroughly researched estimate, you might find out that it’s really hard to nail down an exact, final number of what the project will cost. Sometimes bids will include a range of costs or optional costs, and sometimes you’ll encounter scope changes that will add more hours (and therefore dollars) to the website price later on down the line. In fact, often times the more skilled or experienced your contractor/team is, and the larger the project budget is, the more likely it is you’ll encounter these price changes. Why is it so hard to stick to a number in web development? I’ve historically been a huge fan of home improvement shows, and some of my favorites star Mike Holmes, an expert contractor and home inspector who values quality construction and doing things right the first time. On one of his shows featuring home inspections gone wrong, he showcased the consequences of an inattentive or inexperienced home inspector missing crucial problems that led to thousands of dollars of headache for the homeowners. This goes to show that a less expensive quote may not always mean a less expensive project, if someone misses something up front that will have a major impact on design or development later! He also demonstrated how, though an experienced home inspector knows to ask the right questions, identify all the signs, and knows what something he sees “generally” leads to, you still don’t really know until you start tearing down walls, which is something even the best home inspector cannot do. An example I remember vividly is an older home where the electrical wiring appeared to have been updated based on checking at the outlets, but after ripping up the walls they found only three feet of the wires had been updated just where people could check in an inspection, and all the in-wall wiring was the older knob-and-tube method, causing major delays (and added cost) getting the home up to code. Similarly, even though an experienced contractor or team will know what to look for and ask based on their years of experience dealing with similar situations, they won’t necessarily know all the nuances until they start writing code. Maybe a third party they need to integrate changed their API since the last time they worked with it, or an internal system isn’t giving them enough access, or a particular query doesn’t run as expected, or you’re using some other plugins that have a conflict with what they are trying to do. This is why doing a separate paid discovery phase before the project can be quite useful! Though it won’t eliminate all scope changes, an in-depth analysis of the project (including any existing materials, analytics, or codebase) can minimize surprises and result in a more accurate quote. There are several different payment terms that a bid or estimate might contain, and I wanted to cover the basics of these here, as well as my thoughts on when each type is the most appropriate. Each contractor or team has their own pricing methodology, so make sure to get the details on their expectations before you begin. Flat Fee Pricing – A fixed number for services rendered, often charged in increments including an up-front deposit, with final payment due before product is delivered. How contractors or teams arrive at this fee depends on the factors above, as well as whether they are time-and-materials based, value based, or something else. Either way, I usually recommend flat fee pricing for projects where the deliverables and scope are well-defined and not ambiguous. Hourly Pricing – Charged for the time actually spent, and billed incrementally (usually on a fixed schedule, like weekly or monthly). Though many projects I work on are flat fee, hourly or time-based charges have a place as well. Agile or Sprint-based billing can take this form, as well as exploratory or iterative projects. I usually recommend hourly pricing for projects where the deliverables are unknown, or the goal is constant iteration and refinement. I have also used this for small-scale followup projects in order to revise or add functionality to an existing site, but I think the next price structure is often a better fit. Retainer – paying in advance for a set number of hours that expire after a predetermined amount of time (often monthly). These can follow a “use it or lose it” format, or roll over unused hours to the next billing period. This is the equivalent of keeping someone on reserve, to know that they will be available and prioritize you if you need them (which may not be the case with on-demand hourly work). Many maintenance contracts are often set up like this. Hopefully you are feeling more comfortable talking money and budgets with your potential WordPress website professional. When in doubt, ask questions! Now that you are armed with the knowledge of what goes into a web design or development project, you’ll be able to have an informed conversation where everyone can participate their fullest. If you have any other questions about WordPress pricing, I highly suggest you read some of the articles on Chris Lema‘s blog as a start. As an experienced professional in both the enterprise software and WordPress space, his insights are invaluable and hopefully provide more details about specific topics we may have only lightly touched on. You’re ready to begin your project, and I’m sure you’re very excited! But once you begin, good communication is vital, which is why in Step 5 we are focusing on how to give quality feedback on a web design and web development project.